Comedy Central has announced that The Minority Report with Larry Wilmore will replace The Colbert Report since Colbert is leaving to host the Late Show on CBS. NEW YORK, May 9, 2014 – Comedy Central has pulled from the ranks of “The Best F*&#ing News Team Ever!” and today announces the Emmy(R) Award-winning Larry Wilmore as the host of the #1 brand in comedy’s next great late night franchise. Wilmore will take over the highly-coveted post-“Daily Show” time slot in January 2015 as host of “The Minority Report with Larry Wilmore,” a comedic look at news, current events and pop culture from unique perspectives not typically on display in late night television. The series was created by Jon Stewart and will be produced by Stewart’s Busboy Productions with Stewart and Wilmore serving as Executive Producers. “The Minority Report with Larry Wilmore” will provide viewers with a distinct point of view and comedic take on the day’s news from a perspective largely missing in the current late night landscape. Hosted by Larry Wilmore, the series will feature a diverse panel of voices currently underrepresented in comedy and television. More details will be revealed at a later date. 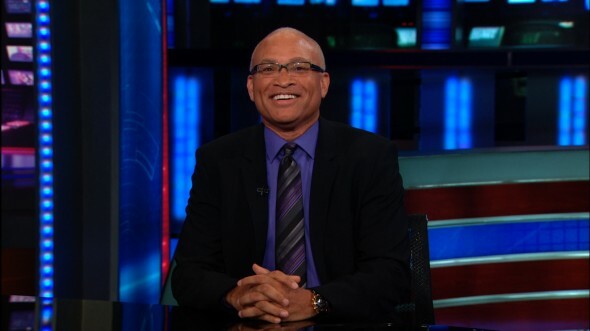 Currently “Senior Black Correspondent” on “The Best F*&#ing News Team Ever!,” Larry Wilmore joined “The Daily Show with Jon Stewart” in 2006 after an award-winning career in television writing and producing in the early 90s. Wilmore (@thelarrywilmore) has written for shows such as “In Living Color,” “The Fresh Prince of Bel Air” and “The Jamie Foxx Show.” He co-created the animated show “The PJs” with Eddie Murphy, as well as the critically-acclaimed and award-winning “The Bernie Mac Show,” co-created with the late Bernie Mac, which won the Emmy Award for Outstanding Writing for a Comedy Series in 2002. Wilmore was also a consulting producer on NBC’s “The Office,” also appearing in a few episodes. More recently, he served as executive producer/showrunner on ABC’s “Black-ish,” which just received a series pick-up. Wilmore, who started his career as an actor and stand-up comic before transitioning to writing and producing, has also appeared in “Dinner for Schmucks,” “Love Bites,” “Traffic Light,” “Accidently on Purpose” and “Happy Endings.” His first book, titled “I’d Rather We Got Casinos and Other Black Thoughts,” was released by Hyperion Books in 2009. In addition to receiving an Emmy, Wilmore has been nominated for and received numerous other awards including a Peabody, Humanitas and NAACP Image Award. Wilmore is represented by UTA, 3 Arts, and Tom Hoberman. Video of recent Wilmore appearances on “The Daily Show” can be found here: on.cc.com/1m6L26M. Viacom is home to premier global media brands that create compelling television programs, motion pictures, short-form video, apps, games, consumer products, social media and other entertainment content for audiences in more than 160 countries and territories. Viacom’s media networks, including MTV, VH1, CMT, Logo, BET, CENTRIC, Nickelodeon, Nick Jr., TeenNick, Nicktoons, Nick at Nite, Comedy Central, TV Land, SPIKE, Tr3s, Paramount Channel and VIVA, reach approximately 700 million television subscribers worldwide. Paramount Pictures, America’s oldest film studio, is a major global producer and distributor of filmed entertainment. For more information about Viacom and its businesses, visit www.viacom.com. Keep up with Viacom news by following Viacom’s blog at blog.viacom.com and Twitter feed at www.twitter.com/Viacom. What do you think? Do you plan on giving this new show a shot? More about: The Minority Report with Larry Wilmore, The Minority Report with Larry Wilmore: canceled or renewed?